The first occasion I faced a Pep Guardiola team, I sat alone on the team coach after the match and for the first time in my playing career I thought seriously about retiring from football. That was the 2009 Champions League final in Rome, forever in my mind the lowest point of my 23 years as a professional footballer. We had got it wrong that day, Barcelona had got it right and as I contemplated my life at that moment my overriding emotion was that I never wanted to feel like this again. If that meant ceasing to play football then - at that moment, at least - so be it. 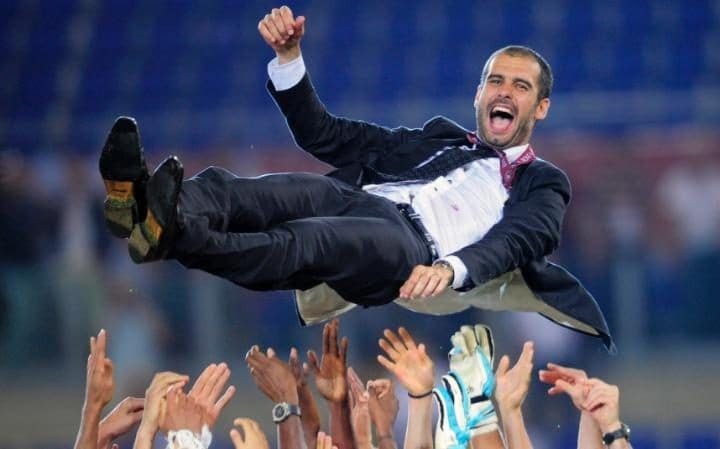 Pep Guardiola is thrown into the air by his Barcelona players after completing the last leg of a 2009 Treble at Ryan Giggs' expense. CREDIT: AP PHOTO/MANU FERNANDEZ. That was Guardiola’s first season as manager, which he crowned with the magnificent achievement of winning the Spanish league, the Copa del Rey and the Champions League all in one go. Guardiola has gone on to become the manager of this generation and on Saturday he faces his next big challenge with his Manchester City up against the leaders Chelsea. I was captain of United the night he sealed his reputation in Rome, and that game - that season - rightfully has its place in history now. But if you go back to the details of the build-up to the match there are aspects that might surprise you. For starters, we were favourites to win that final, we had been in great form since the turn of the year and yet as soon as we arrived in Rome things started to go wrong. Giggs slides in to try to tackle Samuel Eto'o. CREDIT: GETTY IMAGES. The hotel was terrible. A small detail? Perhaps, but when you are playing a Champions League final the little things can be a big deal. We had played Roma twice the previous season and stayed outside the city, a beautiful, private place. The club wanted the same hotel but Uefa had booked it and instead we were given somewhere in the middle of the city. Immediately it felt wrong. There was no room to relax away from the throng of people in the city for the game and the squad felt on edge. I had been around United teams long enough to know the mood was not quite right. 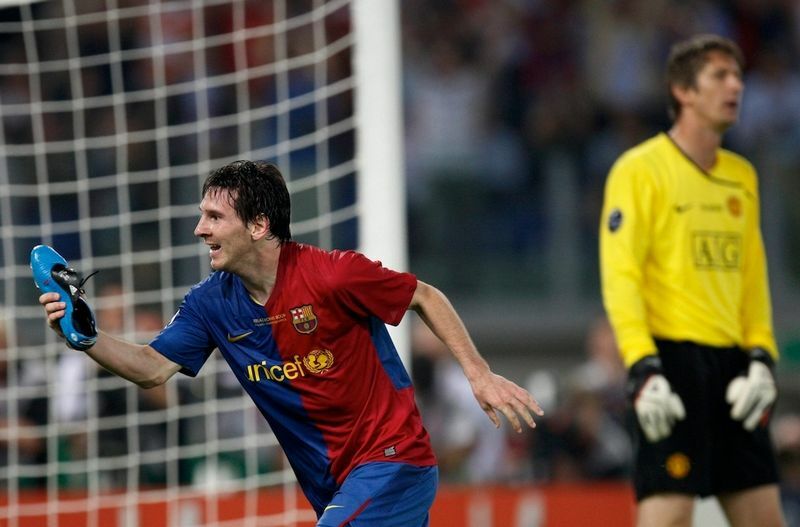 Lionel Messi turns away from Edwin van der Sar after scoring Barcelona's second in Rome with boot in hand. CREDIT: REUTERS. Yet we felt sure we would win. In the build-up the news was that there were major injury doubts over Thierry Henry and Andres Iniesta - that one or both would not start. Henry played 72 minutes and Inieista came off in injury-time at the end of the game. Even so, the Barcelona defence that night was not at full strength. Yaya Touré was at centre-back alongside Gerard Piqué who was not yet the player he would become. Carles Puyol was at right-back. Sylvinho, then 35, was at left-back. We got it wrong, and the players have to take responsibility for that. I put my hand up. We got a bit of joy in the early stages of the game pressing them and I think that just meant that, myself in particular, we played higher up the pitch. I ended up in a No10 role when I should have been deeper helping our midfield to control the game. They scored the Eto’o goal that we should never have conceded and the game slipped away. 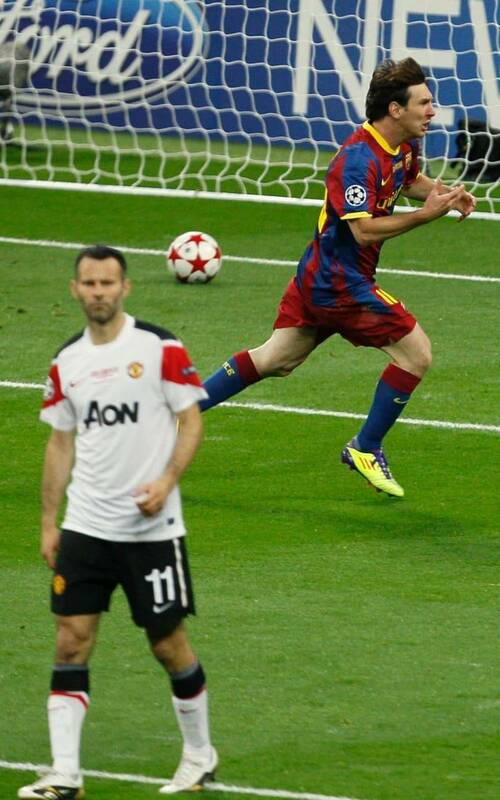 Then Lionel Messi scored a header with 20 minutes left and we just never recovered. I have to say that being captain that day I also look back at the chance to have lifted the trophy. It would have been a wonderful moment. Most of all I look back with regret that as captain I should have led by example and I did not have my best game. That was my first experience of Guardiola and two years later we were back up against his Barcelona in the 2011 Champions League final at Wembley. By then they were a much more established team and probably the favourites to the win the game but we fancied our chances. We still thought we could beat them. Messi does it again, this time at Wembley two years later. CREDIT: AP. We had Park Ji-sung and Antonio Valencia on the wings. I was in the deeper role with Michael Carrick. Up front we had Wayne Rooney and Javier Hernández – 'Chica' to the lads – who was scoring goals for fun. Again, there was another silly goal conceded, to Pedro. Another second-half goal from Messi that knocked the stuffing out of us. Looking back on 2009, I know that in those hours in the aftermath of the game in Rome and in the immediate days that followed I was close to retiring. I felt I needed to have a serious look at myself. All my career, by and large, I had been able to perform in those big decisive games that make history and then this was one occasion that I had not. Barcelona pose with the trophy after winning their second Champions League in three years by defeating Manchester United. CREDIT: GETTY IMAGES. My emotions were quite overwhelming at the time but over the course of the summer they subsided and eventually I recognised them for what they were – the extreme reaction to a defeat in the biggest game of all, a Champions League final. I was 35 back then in 2009 and I would go on to play another five seasons for United. I am glad I did not miss out on all the experiences and the three major trophies that followed. I resolved then never to make decisions quickly in football, but to take my time and see how life panned out. That defeat made me re-examine my game and ask myself what I could do to improve. Perhaps I have Guardiola in part to thank for the measures I took to stay at the top for those last five years. Although I know now, as I knew then, that I never want to feel the way about football I did that May night in Rome seven years ago.